In this extraordinary – at times harrowing – memoir we see the Lesser family deal with the impending death of Maggie, the high-spirited hummingbird in the family. Maggie needs a bone marrow transplant and her older sister Liz is the perfect match. The other two sisters remain outliers (not by choice), intensifying the family conflict. Intense, raw, and brutally honest, Liz and Maggie are forced to communicate in a way that had eluded them growing up. Things unsaid were embedded in the family’s core and, through acts of bravery, the “wounded healing” begins. 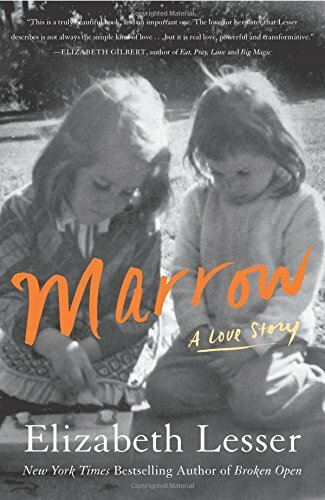 While “marrow” refers to the painful transplant Liz undergoes in an attempt to save Maggie’s life, “marrow” is more frequently and powerfully used as a metaphor for the core of the sisters’ relationship — where the “stem cells of life” originate and the sisters’ assumptions about each other are often distortions and lies. Each sister tells a different story of her childhood, viewing the family dynamics though a different lens. “We will dig for our goodness and harvest the marrow of ourselves for each other…” the two sisters promise each other as they consent to therapy and spiritual approaches to death and dying. The author mingles Buddhist meditation, philosophy and literary allusions sometimes successfully (and sometimes not) in seeking meaning not only for Maggie’s premature and terminal illness but also for human connection. At the end there is only the feeling of being “helpless with love” and a lesson for us all in facing the death of loved ones – and our own death. Marrow is a deeply affecting trigger to the heart about love, family and learning to let go. This memoir is for those who can face a narrative about trauma in life without getting depressed or angry. I highly recommend it! A review copy was provided by the publisher. This book was published on September 20, 2016. Diana Y. Paul, a retired Stanford professor, is the author of three books on Buddhism and Things Unsaid: A Novel (She Writes Press). You can read her reviews of films and art at: http://www.unhealedwound.com/. When a deadly disease strikes, it’s often not clear whether this is harder on the afflicted person or those who surround him/her. This is a point well made in the memoir Marrow: A Love Story by Elizabeth Lesser. Lesser’s sister Maggie battled lymphoma cancer which went into remission, only to return after seven years. Maggie had one chance for survival, a bone marrow transplant from the perfect donor. That perfect donor happened to be her older sister, Elizabeth. If successful, Maggie would live on with her sister’s blood literally coursing through her veins. In a sense, the sisters would become one, the team known as Maggie-Liz. But the sisters had not gotten along superbly well in their five-plus decades of living, so they realized they would have to overcome the issues that had sadly separated them in the past. Marrow is a fascinating look at how two people worked extremely hard to find love and forgiveness among the ruins of pain and suffering. Lesser makes clear, however, that what worked for her and Maggie might not work for others. (If there’s a flaw in the telling, it is that Lesser often gets caught up in the forest – the world, the universe, the meaning of Existence, instead of focusing on the trees – the lives of her and her sister.) And yet, this is an inspiring tale of courage. It’s also a reminder that love conquers all, even when death stands poised to strike. This book was released on September 20, 2016. 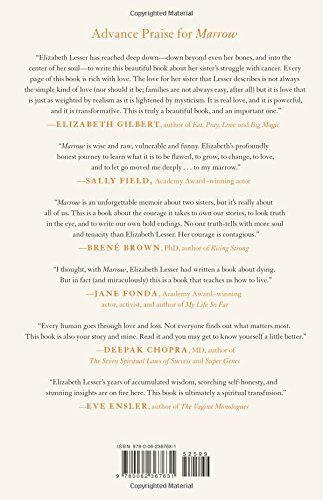 Elizabeth Lesser also wrote Broken Open: How Difficult Times Can Help Us Grow. 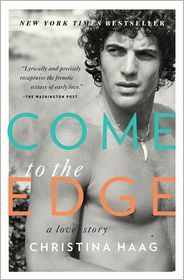 The hardbound release of Come to the Edge bore the subtitle, A Memoir. The re-release has what is perhaps a more appropriate subtitle, A Love Story. This is a grand telling of a love affair between a young man and a young woman that ran for five years; one that did not end in marriage and a happily ever after existence. Suffice it to say that we don’t often learn of the details of private loves and losses, other than in works of fiction or in the biographies of prominent Hollywood actors but Haag is very transparent here about what happened – the good and the bad. At one point she tells us that, “I saw myself growing old with him.” Later she explains that their falling apart was not the stuff of great drama, their relationship (which was first a long-term friendship before it became a romance) simply slowly faded-out and away. So perhaps John Kennedy, Jr. had to struggle with a different type of curse during his lifetime – the curse of being one of the world’s favorite sons, greeted with adoration and adulation (and lust), even when he wasn’t quite sure he’d done enough to earn it. Thanks to Haag, the reader does come to know his mother, Mrs. Onassis, quite well. The former First Lady comes across as a woman of grace, charm, dignity and loyalty. Not all of the Kennedys are portrayed in such a positive light, but then this adds a sense of honesty and directness to the account. Haag’s prose is distinct and memorable as she tells us about a five-year love affair with a man who married another, and who then – like his father – died all too young. This memoir is just the right length. And there’s another true story waiting in the wings to be told by this actress (another memoir). That will be the story of her battle to survive breast cancer. Based on the compassionate nature of this account, it will be one to buy. 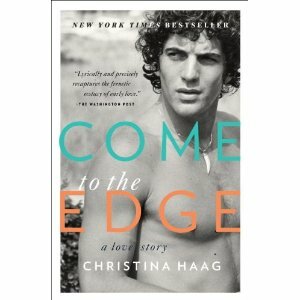 A review of Come to the Edge: A Love Story by Christina Haag. In my opinion, this was a good to very good year to be a reader; not as good as 2010 in terms of its offerings, and hopefully not as good as what’s to come in 2012. Let’s look at some of the highlights and lowlights of 2011. The e-book readers offered by Amazon, Barnes & Noble and Sony began to finally take off in terms of general acceptance. Even a Luddite such as I am picked up a Nook Color tablet, as the issue of glare seemed to have been resolved with the fine screen manufactured by LG. But just as e-readers were taking flight, the reading public received some very disturbing year-end news (“…rising e-book prices causing sticker shock.”). It seems that publishers are about to kill their golden goose by raising the prices on e-books to levels that will match or exceed the print versions. Yes, it appears to be a replay of what happened with the recording industry… Music CDs first appeared with reasonable prices of $9.99 and then shot up to double that and more; and the industry then wondered what happened to their sales figures. Duh. It was a good time for biographies, the two most notable being Steve Jobs by Walter Isaacson and Robert Redford by Michael Feeney Callan. Both were examples of treating famous people as more than living legends – turning them into three-dimensional figures with true strengths and weaknesses. Callan’s book is such a fascinating portrait of the actor that you’ll want to see every film mentioned in it. 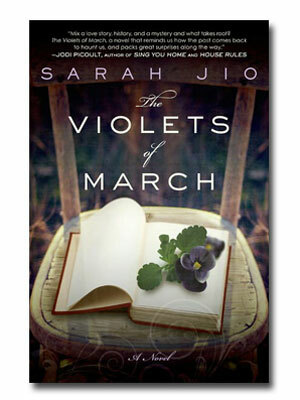 It’s always fun to discover new writers at the start of their career, and both Proof of Heaven by Mary Curran Hackett and The Violets of March by Sarah Jio were engaging life and love-affirming debut novels. Kudos! A Widow’s Story: A Memoir by Joyce Carol Oates might have been a groundbreaking account of what happens to a wife after her husband dies suddenly. But it was preceded four years earlier by Joan Didion’s The Year of Magical Thinking. Oates’s account unfortunately read like a note-for-note cover of Didion’s earlier account. Oates and Didion are, no doubt, two of our best writers but only one of them could assemble a uniquely first tragic memoir. 2011 was the year in which a few fictional works were introduced that I wound up calling “plotless novels.” These were books whose plots generally centered around an ensemble cast of characters, occupying only a few days in time; time in which nothing noteworthy seemed to occur. Reading one of these novels is like, paraphrasing Jerry Seinfeld, perusing “a story about nothing.” A few misguided or mischievous critics made them popular by praising them as being clever. Well, they were clever in getting a few unfortunate readers to pay money for a book without a beginning, middle or ending. Another parallel troubling trend had to do with novels that took 90 or 100 pages to get to the beginning of the story. Any story that takes that long to get started is, trust me, not going to end well. While there were some good and very good works to read this year, it’s hard to think of standouts like we had in 2009 (Her Fearful Symmetry by Anne Niffenegger) or 2010 (American Music by Jane Mendelsohn, Imperfect Birds by Anne Lamott, The Unnamed by Joshua Ferris). One novel that did receive plenty of attention was The Marriage Plot by Jeffrey Eugenides, which the average reader seemed to find either brilliant or meandering and tedious. One hundred and sixty-eight readers posted their reviews on Amazon and these love it or hate it views balanced out to an average 3-star (of 5) rating. Some were troubled by Eugenides’ novel because of the lack of likeable characters, a critique to which I can relate. If an author does not give me a single character that I can identify with, trying to finish a novel seems pointless. Why invest the time reading a story if you simply don’t care what happens to the characters the writer’s created? This year was filled with unrealized potential. Let’s hope for a bit more excitement in the publishing world in 2012! 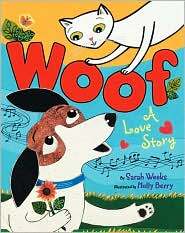 Woof: A Love Story by Sarah Weeks; Illustrated by Holly Berry (HarperCollins, $16.99, 32 pages). Age range: 4 to 8. A dog is a dog/ and a cat is a cat/ And most of the time/ it’s as simple as that/ Or is it? Young children’s literature is alive and well! The dynamic duo of author Sarah Weeks and illustrator Holly Berry have teamed up to create a colorful, delightful and endearing picture book. Woof is the story of a dog who, at first glance, becomes smitten with a lovely white kitty. His tale is set forth in rhyming verses guaranteed to delight both the listener and the reader. The illustrations are created using an imaginative combination of original woodcuts and photographic images. The effect is just eye-catching enough to enliven the story without being jarring. Woof is big enough for the reader to hold it while allowing the listener to easily turn the pages. Although the story line is a bit improbable (it involves a buried trombone ), it sets the stage for a dialogue about ways of communicating that can take place between the person reading the book and his or her young listener. Clearly, woof and meow are not the only way for the two characters to share their feelings. Music is the key to their understanding of each other. Delightful – 5 Woofs (or Meows). Highly recommended.